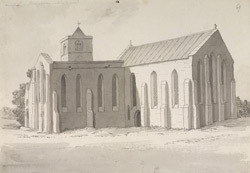 A south-east view in ink of the Church of St Mary the Virgin at Ovingham in Northumberland. Consecrated around the year 1050, it is thought to have been built on the site of a much earlier place of Christian worship. Evidence for this comes from a standing cross found in the area, a fragment of which is under the church pulpit. The building has a Saxon-era tower, a Norman-era doorway, and an Early English Nave and Chancel.